11 March 1904: Entered the Army as a Fahnenjunker in Infanterie-Regiment General-Feldmarshchall Prinz Friedrich Karl von Preußen (8. Brandenburgisches) Nr.64. 1 October 1912: Regimental Adjutant of Infantry Regiment 64. 24 December 1914: Company Chief in Infantry Regiment 64. 1 December 1915: In the General Staff of Army High Command 9. 27 January 1917: In the General Staff of the 21st Reserve Division. 22 April 1919: Military District Inspector. 1 December 1919: Company Chief in Reichswehr Jäger Battalion 3. 1 May 1920: Company Chief in Reichswehr Infantry Regiment 5. 1 January 1921: Company Chief in Infantry Regiment 9. 1 May 1922: On the staff of Artillery Leader III. 1 February 1924: On the staff of Infantry Leader VI. 1 October 1926: On the staff of the 4th Division. 1 July 1929: Commander of the III. Battalion of Infantry Regiment 18. 1 April 1932: Commander of Infantry Regiment 15. 1 October 1934: Commander of the Stuttgart Border Defense Area. 15 October 1935: Commander of the 24th Division, Chemnitz. 1 April 1938-26 August 1939: At the same time, Commander of Wehrkreis [Military District] XVII, Wien. 23 January 1942: Führer Reserve in the Army High Command. 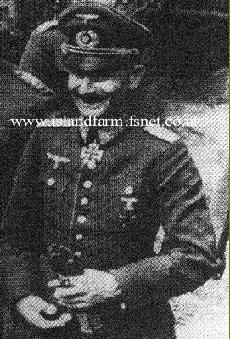 1 May 1942-1 February 1945: Deputy Commanding General of the II Army Corps and Commander of Wehrkreis II, Stettin. 1 February 1945: Führer Reserve in the Army High Command. 8 May 1945-May 1948: Prisoner of war. Knight's Cross of the Iron Cross: 31 August 1941, General der Infanterie, Commanding General of the XVII Army Corps. German Cross in Silver: 22 April 1945, General der Infanterie, Deputy Commanding General of the II Army Corps and Commander of Wehrkreis II. Kienitz was highly decorated during World War I. Note he held both the Royal Hohenzollern House Order and the Princely Hohenzollern Honor Cross. Despite the close similarity in names, these were two separate yet affiliated orders. The first one was the personal house order of Kaiser Wilhelm II, the King of Prussia and Emperor of Germany, while the second one was the personal house order of the Kaiser's Catholic cousins in Sigmaringen. Both decorations were virtually identical in appearance except for different centrepieces and mottos, VOM FELS ZUM MEER ("From the Mountains to the Sea") and FÜR TREUE UND VERDIENST ("For Fidelity and Merit") respectively. 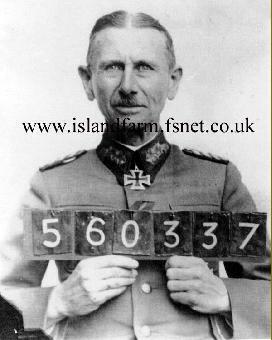 Click here to see a photo of General der Infanterie Werner Kienitz in the company of fellow prisoners of war at Island Farm.